Power distribution pole networks are vulnerable to a changing climate. Climate change can increase wind speeds, and changes in rainfall and temperature can accelerate timber decay, affecting residual capacity of timber power poles. The present paper utilises advanced stochastic simulation methods to examine climate change impacts, and possible climate change adaptation strategies, for Australian power distribution networks. The assessment framework developed, which is applicable to a wide variety of infrastructure types and research areas, utilises probabilistic methods to investigate the appropriateness of climate adaptation strategies aimed at ameliorating the impact of climate change on critical infrastructure. Measures investigated include alterations to design or maintenance practices through, for example, installation of larger poles, more frequent inspections, or changes to pole replacement criteria. A cost-benefit decision analysis is developed herein using the latest AR5 climate projections, network vulnerability, adaptation measures, and cost and loss data for both direct and indirect costs. The net present value and benefit-to-cost ratio is calculated for different adaptation strategies over the life cycle of the assets up to the year 2090. An adaptation measure that allows for the installation of larger poles but less stringent pole replacement criteria has the highest net benefit—with a mean potential saving of hundreds of millions of dollars. The online version of this article (doi: 10.1007/s10584-017-2000-6) contains supplementary material, which is available to authorized users. 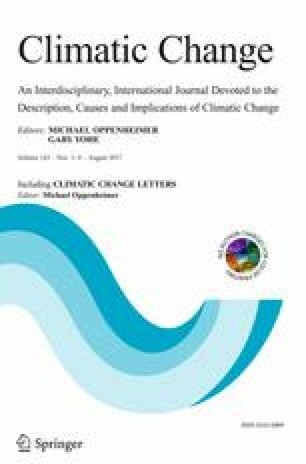 The authors appreciate the financial support of the Commonwealth Scientific and Industrial Research Organisation (CSIRO) Flagship Cluster Fund through the project Climate Adaption Engineering for Extreme Events, in collaboration with the Sustainable Cities and Coasts Theme of the CSIRO Climate Adaption Flagship. Costing data provided by Nathan Spencer from URI Engineering is gratefully acknowledged.